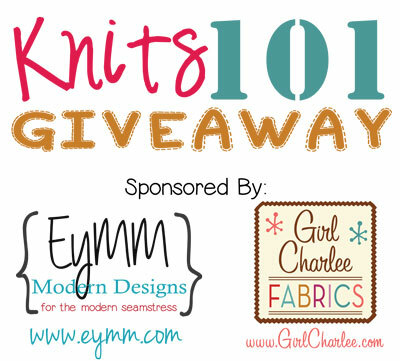 Knits 101 Week: Series Info & ENTER TO WIN! – Everything Your Mama Made & More! 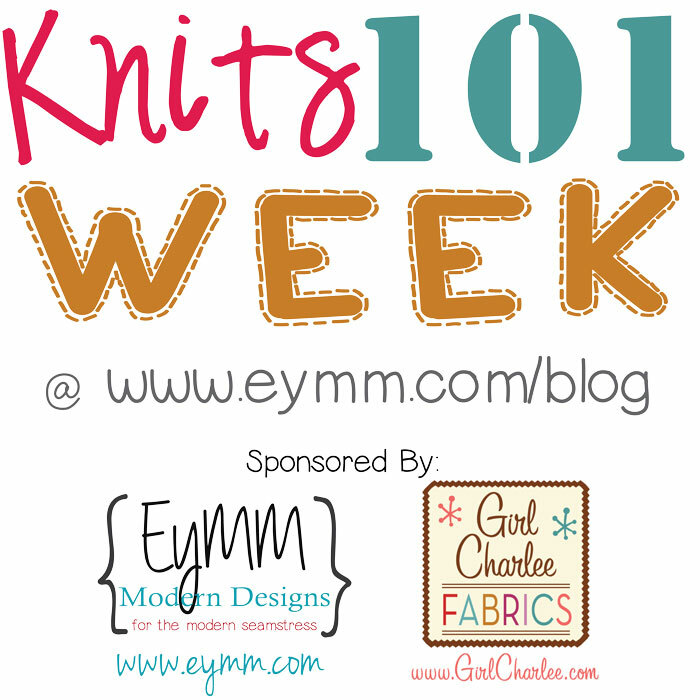 Knits 101 Week: Series Info & ENTER TO WIN! Being that most of the EYMM patterns are designed specifically for knits, one of the most common questions I get is ‘Where do you find your knits?’ I answer that I purchase some locally, but, since I live nowhere near a fashion district, I do 90% of my fabric shopping online. I then get asked ‘How do you know what you’re buying?’ Also, when I tell people that I love and recommend Girl Charlee, some who have ordered in the past are cautious because they have purchased fabric that was not what they were expecting. So, I am excited to announce the Knits 101 mini series! Over the next week I will be sharing information about the different types of knits, weight, stretch, recovery and more. I will also share tips for sewing with knits and talk about various machines that can be used. While I will be sharing a lot of links to the Girl Charlee site, I will also be linking to many other stores and sites that I shop at online. I am really looking forward sharing all this information with my readers, so I reached out to Girl Charlee and they offered to give away one of their extremely popular (and very hard to get!) 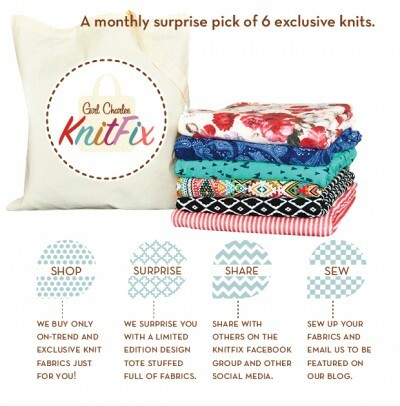 April KnitFix bags! I have gotten bags the last 2 months and have been very pleased with what I have gotten! The best part? If you don’t love one or two of them, they have a Facebook group where you can buy, sell, and trade KnitFix fabrics! 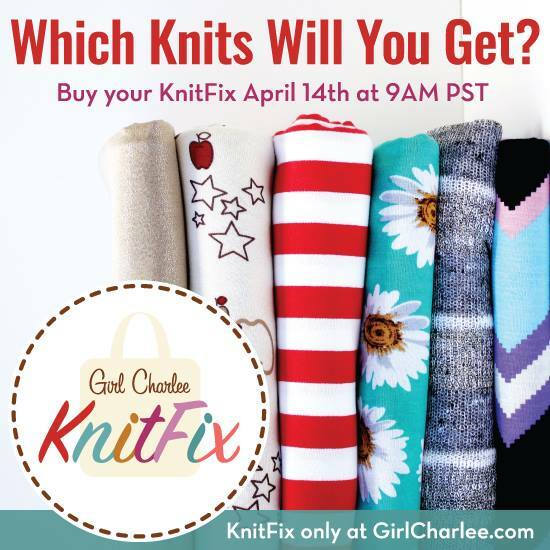 The KnitFix goes on sale on the second Tuesday of the month at 9am PST which is 4/14 for April so set your alarms. Inventory is limited and they rarely stay in stock for a full day! $69.00 plus shipping for six 2-yard cuts (12 yards total) … it’s no wonder they sell out fast! I personally love it because, while I consider myself pretty experienced with knits, I have tried new types of knits and different prints since joining and fallen in love! Even the lighter weight knits are great for many of the clothing patterns from EYMM. 😉 If you don’t already have an account, I do recommend signing up for a free account HERE to make check out faster. We will come back and include links as each day’s topic is posted, here is a quick summary of topics we will be covering. Day 1 ~ Knit 101 mini series intro (that’s today, right here 😉 ). Day 2 ~ Different types of knits and how to tell them apart. Day 3 ~ Content & common blends of knits and what they are well suited for. Day 4 ~ Fabric weight, knowing the fabric blend combined with the weight makes it easier to shop online. Day 5 ~ Stretch and Recovery, different percentage blends, and 2-way versus 4-way stretch & FREE printable stretch guides. Day 6 ~ Needles, thread, and machines! what you need and what they are used for. On to the fun part … the giveaway! With all this talk about knit fabric and knit patterns why not have a little giveaway! To enter the giveaway see the Rafflecopter tool at the bottom of this post. You may complete as many or as few as you would like. The more entries the better your odds are to win. Prizes are provided by EYMM and Girl Charlee. The KnitFix prize is open to the US entries only. The digital pattern prizes are open internationally. Contest ends at 11:59 PM PDT on 4/13/2015. 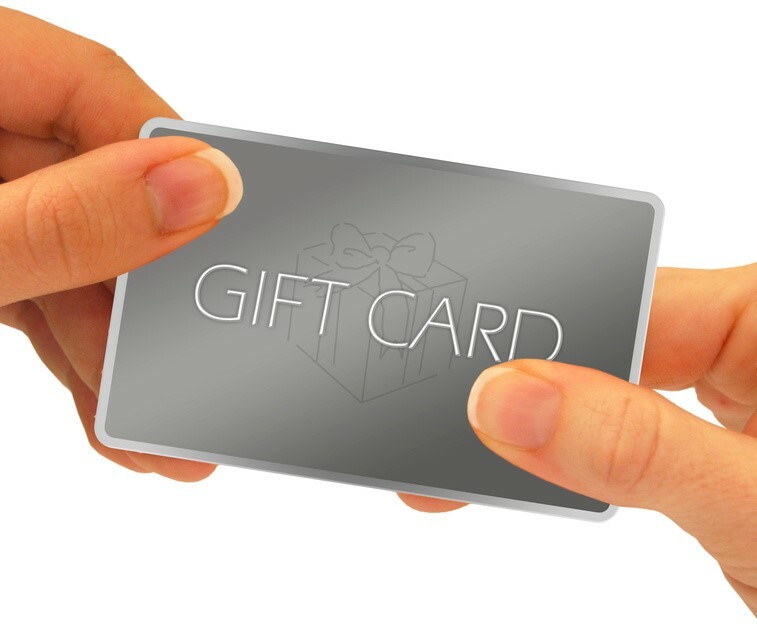 No purchase necessary, many will enter only a few will win. Thanks to all those who entered, but only 5 can win ;). The winner of the Knit Fix is Christina B., the winner of the 5 pattern Bundle is Wendy M., and Cassie M., Sarah M. & Sarah S. will each receive a $15 EYMM Gift Card! Don’t forget to get YOUR KnitFix tomorrow at 9am and come back tomorrow afternoon for the series round up. I can’t wait to get going on one of these great patterns or with some of this cute fabric for my granddaughter. I would love to try a Dolman in some of that cute feather print knit. I would have to get the women’s asymmetrical top and the California dress and peplum top. Love those both. I have to be honest, I am new to knits, so I would be happy with just trying any right now, lol, but I do love the chartreuse purple floral on white cotton jersey blend, the bold feathers on white blend, the original feathers on white, and the teal orange cherry blossom jersey blend. I would sew up some stuff for me! how exciting love girl charlee and eymm! Kids spring clothes and a maxi skirt for me are on my knit wish list. Thanks for offering this! This is an awesome idea. Can’t wait to read and follow along! Thanks. I have yet to purchase a pattern because I’m overwhelmed by purchasing knits, so I can’t wait to read through this series! I’m all about tops, so I’d start with Kymie’s Dolman than work on the Piko and the Flutter top. I’ll make my way through the series before working on a wishlist, but I like their selection. i would love to get some matching mommy daughter patterns and girl charlee knit fix is always on my wish list. Plus pretty much everything else on the site. I would make the Asymmetrical Drape Top or the Piko Top! And I can’t even begin to tell you how many fabrics are on my Girl Charlee wishlist… It’s my go-to shop for fabric! Love me some florals. 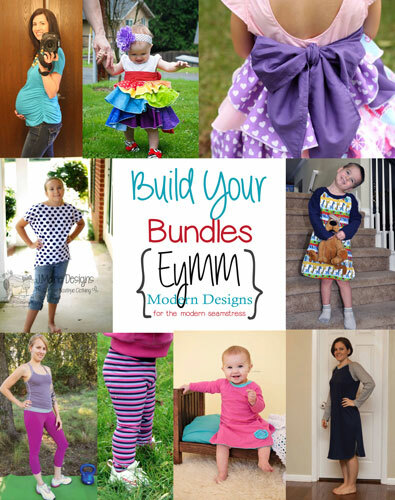 I’ve been dying to try the stretch denim from girl Charlee and the hoodie, leggings and nightgown patterns from eymm! I would buy the dolman pattern’s for me and my daughter! 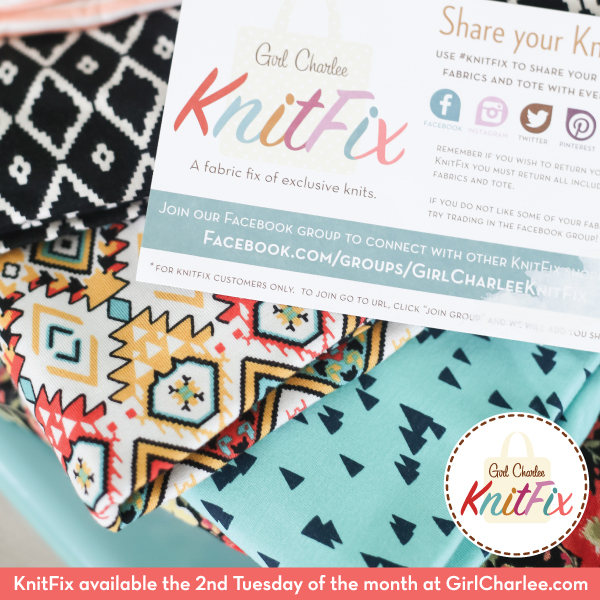 If I won the gift card to girl charlee, I would get some of the cotton jersey knit fabrics, I just don’t know what print yet, there are so many great choices! I would make some summer skirts for me and my girls. I LOVE Girl Charlee AND EYMM!!! What a fabulous idea! I’m new to kits and would love the opportunity to work with such gorgeous prints and patterns!!! I would really like to get the woman’s California dress/peplum and the “get movin” pants. Really need a comfortable summer dress and need new workout pants. I love bright colors, so definitely the feathers or even the arrow fabrics for the bottom of the dress and a coordinating solid for the top, if that’s possible. Just a simple solid for the pants, really like the idea of a dark purple and a navy, need to get away from all the black I’ve been wearing lately. I would get the calla lily skirt/skort pattern and some of the elephant print cotton jersey. This is a fabulous series! I’m new to sewing with knits, so I need all the help I can get. I would pick Riley’s nightgown from EYMM and the Summer Rainbow stripe swim fabric. I’ve been dying to make the Four Season Cardigan using Red Vegan Leather!! I’d love to purchase the Get Moving Bottoms and use the Stars spandex fabric from Girl Charlee! The series has been great! There are a lot of great tips on how to sew knits and how to know what you’re working with fabricwise. Great series Kymy! I bought the drape shirt pattern for me and would love to find some fabric for myself. I would also buy a dress pattern for my daughter. I would love to win some knits! You all actually helped me be not afraid if knits anymore! the first time I sewed with knits I was scared but I wear my shirt all the time! i would have to get the kymy dolman top and definitely his and hers hoodie and hooded vest. i am loving the plaids that are coming back and all the arrows and feather fabrics! Love the kenzie party dress and the his and her hoodie pattern! love the California dress pattern and the arrow fabric from girl charlee!